The following translation of the biography of master Hai Deng stems from two Chinese language source texts. The primary text is entitled ‘海灯法师’ (Hai Deng Fa Shi – Hai Deng Dharma Master), and is authored by Mr Feng Jun (冯君), a scriptwriter for Chinese TV, and a personal student of master Hai Deng, studying both tradition Chinese poetry and Chinese martial arts. This biography covers a select number of years fairly well, but omits (completely) details concerning master Hai Deng’s association with master Xu Yun (1840-1959) on Mount Yunju which occurred between early 1956 and late 1957. I have remedied this by accessing the Chinese language text entitled ‘海灯法师在禅宗的殊胜地位----沩仰宗第九祖’, (Master Hai Deng of the Ch’an Sect Holding the Wondrous Status – 9th Generation Lineage Inheritor of the Wei Yang Lineage), which is a typical representation of the generic texts available regarding master Hai Deng. I have inserted into the translation of the first text, an edited extract derived from the translation of the second text. The insertion is clearly marked and describes fully master Hai Deng’s life on Mount Yunju. Master Hai Deng’s life is significant for a number of reasons. Not only was he a very well respected Ch’an master living in the time of Xu Yun, and the inheritor of the Wei Yang Lineage, he was also an accomplished scholar in Chinese classical literature, and a martial artist of some renown. He was considered a martial arts master before ordaining as a monk, and when he visited the Shaolin Temple (in Henan) in 1945, he was awarded (by the abbot) the award of ‘National Skilful Teacher Degree’ (国术教授 – Guo Shu Jiao Shòu), a distinct and extraordinary honour considering the source. His life spanned the 20th century, perhaps the most destructive and transformative of China’s long history, and yet he always managed to move ‘in the gaps’ between the worst excesses and emerge unscathed. Toward the end of his life, he was extensively filmed and photographed and became famous all over China and the world. I am very grateful to Upasika Sheng Hua for providing the second text, and translation advice, and Upasika Yukyern who has read through (and edited) the finished English text. Master Hai Deng’s lay surname was ‘Fan’ (范), and his fore-names were ‘Wu Bing’ (无病). He was born in Jiangyou County, Sichuanprovince in 1902. Master Hai Deng – whose real name was Fan Wu Bing (范无病) – was known from childhood to be intelligent, fond of literature, conscientious toward his academic studies, and very interested in the practice of Chinese martial arts. At the age of 19 years old he gained entry to the Sichuan University Faculty of Liberal Arts. However, as his family were not wealthy, they could not afford the university fees. This led master Hai Deng to change the place of his studies to that of the Sichuan Special Police College (situated in the provincial capital of Chengdu), the fees of which (for each student) were paid for by the government. Whilst studying in Chengdu, he often took time to travel widely, seeking out authentic knowledge with respect to spirituality and martial arts. He met with the Shandong Daoist scholar named Zhi Han Zi, and the famous Songshan Shaolin Temple master of martial arts – the venerable Ru Feng. These meetings inspired master Hai Deng to such an extent that he gave-up his conventional studies and instead focused entirely upon the study and mastery of Chinese martial arts. In the spring of 1931, master Hai Deng became tired of the crowds, (constant noise and distraction) associated with life in a busy city, and arranged (through a friend) to travel south (six li – or Chinese miles – about two British miles) to Xindu County, situated northeast of Chengdu. Here he stayed at the Zhen Jing An (镇静庵), or ‘Place of Peace Temple’. Shaolin Jing Quan -少林精拳– or ‘Shaolin Essence-Energy Fist’. Shaolin Gun Fa -少林棍法– or ‘Shaolin Cudgel Art’. Zi Long Qiang Fa -子龙枪法-or ‘Young Dragon Spear Art’. Qing Long Dao Fa -青龙刀法– or ‘Green Dragon Sword Art’. Jiu Bu Lian Huan Quan -九步连环拳– or ‘Nine Step Chain Fist’. Its reflection penetrates through the veil. The heart-mind will not be defeated. Its profound nature is continuously aware. Startled - there is a return to the Four Horse Bridge. At this time, due to master Hai Deng staying in the temple for such an extended period, and routinely coming into contact with Buddhist philosophy, he began to consider the possibility of becoming a fully ordained monk. Originally, it was the intention of the venerable Fo Tai to take master Hai Deng as a disciple, but he was concerned that he was too old for such a task, and that his knowledge of the Dharma was not adequate. Instead, he advised the master to seek Dharma teachers who had advanced knowledge of Buddhist thinking. One such teacher was master Zhi Guang (智光法师) the abbot of Zhao Jue Si (昭觉寺) – a temple in the Chengdu area. Master Zhi Guang’s learning was known to be very profound, and he was considered the most suitable to teach the Dharma to master Hai Deng. The problem was that the Zhao Jue Si was a very popular and crowded temple, and according to the rules of Buddhism, master Zhi Guang could not receive a personal disciple there, particularly one associated with another temple. However, the abbot of the Zhen Jing An – the venerable Fo Tai - met with master Zhi Guang and negotiated an agreement. After this, master Hai Deng was accepted as a Dharma student of master Zhi Guang, and it was decided that his initial ordination and training would take place at the temple known as Wu Yue Gong (五岳宫), situated in the Chengdu area. In the late autumn of 1937, when it was time to depart, the abbot arranged for a rickshaw to carry master Hai Deng to Wu Yue Gong – but he declared that he would not sit down for the journey, but walk all the way. His feet moved like the wind and it seemed that he ran all the way to Four Horse Bridge (Si Ma Qiao - 驷马桥) in a single breath! The rickshaw could not keep-up and fell a far distance behind. Upon arrival at Wu Yue Gong – the venerable Fo Tai and master Hai Deng entered the main hall to pay their ceremonial respects to master Zhi Guang. Master Zhi Guang then shaved his head, and administered the Triple Refuge formula and the Five Precepts. It was at this moment that the name ‘Hai Deng’ (Great Dharma - 海灯) was formally granted by master Zhi Guang. In the early winter of the same year (1937), master Hai Deng and master Zhi Guang travelled together to the Zhao Jue Temple– where the monastic ordination process was finally completed in its entirety. At this time master Hai Deng exclaimed; ‘For the eternal essence, the monk strives.’ Eventually, master Hai Deng served as a teacher of Chinese literature and martial arts at the Zhao Jue Buddhist Institute. At that time, the Bao Guang Temple, and the Zhao Jue Temple enjoyed an equal reputation of being centres for the study of Buddhist religion through the Ch’an tradition. The morality and virtue of the venerable monks produced in these places was well known to be of a high level. This fact made these places very popular amongst the people. At that time, the Bao Guang Temple and the Zhao Jue Temple, as centres for Ch’an training and Buddhist practice were considered to be of an equal, high rank. The previous abbot possessed a deep penetration of Ch’an and was known to be morally pure, and the venerable Fo Tai was considered his equal. Master Zhi Guang was the former Vice President of the Buddhist Association of China and master Hai Deng his disciple. The venerable master Hai Deng attended the Bao Guang Temple both before and after he ordained as a monk, to learn and perfect the Ch’an method. He has also taught the monks martial arts. For decades master Hai Deng has maintained close ties with the Bao Guang Temple. In 1945, master Hai Deng decided to leave Sichuan province and travel far and wide throughout China, visiting the famous mountain areas and seeking out those skilled in martial arts – or ‘拳术武功’, literally ‘fist techniques of martial skill’ (quan shu wu gong). The following year, he visits the Shaolin Temple (少林寺) situated on Song Shan (嵩山). The abbot of Shaolin – the venerable De Yi (德意长老)– confers upon master Hai Deng the ‘National Skilful Teacher Degree’ (国术教授 – Guo Shu Jiao Shòu), in recognition of his profound martial knowledge. This award confirms master Hai Deng’s status as a ‘Professor of Martial Arts’. After Liberation (1949), master Hai Deng travelled around the provinces, participating in a number of national martial art displays and competitions, as well as holding the position of the ‘Shanghai Municipal Sports Teacher for Martial Arts’ (上海市体育宫武术教练- Shanghai Shì Tǐ Yù Gong Wu Shu Jiao Lian). However, even at this time of great historical change, master Hai Deng adhered to the study of Buddhism, medicine and classical Chinese literature – which he viewed as inseparable from the practice (and teaching) of martial arts. His understanding and insight into the old-style classical literature of China attracted praise from other experts, far and wide. His expertise is exampled in his published book entitled ‘少林云水诗集’ (Shao Lín Yún Shuǐ Shī Jí), or ‘Shaolin Cloud Water Poem Collection’, and so on. Chapter 3 –Venerable Xu Yun Entrusts Master Hai Deng With the Wei Yang Transmission. Mount Yunju (云居山) of Jiangxi province. On the 10th day of the 6th lunar month of 1956, master Hai Deng travelled from Shanghai to the monastery on Yunju to be near to master Xu Yun. At the end of the 9th lunar month of 1957, he returned to Shanghai, meaning that he spent around a year and a half at Zhen Ru. Now at this time, master Hai Deng had risen above and beyond all suffering. After arriving, a few people had harsh thoughts toward master Hai Deng, mistakenly assuming that his life of martial training (武功– Wu Gong), and his reputation of martial brilliance was a distraction or form of pollution. However, master Xu Yun (disagreed with this criticism) and asked master Hai Deng to permanently remain at Zhen Ru. At the same time, the then abbot – master Xing Fu (性福和尚) –decided to step-down and retire from this role, leaving the post vacant. Master Xu Yun requested that master Hai Deng assume this role, and following the appropriate ceremonial ritual, master Hai Deng was appointed abbot of Zhen Ru Temple. Soon after, both master Xu Yun and master Hai Deng both lectured to the monks for around 4 months upon the Surangama Sutra (楞严经 – Leng Yan Jing). Whilst at Yunju, master Hai Deng kept up a strict practice that was based upon a fine and diligent scholarship. Master Xu Yun, after an appropriate investigation, declared that the bright mind of the Wei Yang (沩仰) Patriarchal lineage would be passed-on to master Hai Deng, making him the 9th generation inheritor of this Ch’an lineage. He received, at this time, the new Dharma-name of ‘Xuan Ming’ (宣明),or ‘Propagating Brightness’. The 9th generation Dharma of the Wei Yang lineage was also passed-on (by master Xu Yun) to the former abbot – the monk Xing Fu (性福). This transmission ensured that the Patriarchal ancestry of the (Ch’an-Dharma) continued into future generations, unbroken. Master Xu Yun taught the Dharma for decades so that it could successfully spread both within China, and out into foreign lands. This he achieved by choosing carefully those he entrusted with Dharma transmission. His great teaching strengthened the Dharma in Hong Kong, and spread the Buddha-Dharma to America through the efforts of Ch’an master Xuan Hua (宣化禅师). The Zhen Ru Temple has been associated with many great (and old) Ch’an masters, such as Da Ding (达定), the Venerable Mi Guang (弥光), the old monks Hui Tong (慧通), Ti Guang (体光), Ben Huan (本焕), Zhao Ch’an (照禅), Jie Quan (戒全), Jing Hui (净慧), and the President of the Chinese Buddhist Association – master Yi Cheng (一诚), amongst other eminent masters who benefitted from master Xu Yun’s teaching that helped them spread the Buddha-Dharma far and wide. Chapter 4 – Master Hai Deng’s Affection for Yunju. Master Hai Deng spent his time at Zhen Ru living in the hills practicing and teaching Tiantai (天台)Buddhism, practicing martial arts, and the yogic method for feeding ‘hungry ghosts’ (and relieving their suffering) known as ‘Flame Mouth’ (焰口 – Yan Kou). Not only this, but in his capacity as abbot he kept control of the day-to-day running of the temple, and personally presided over the construction of two buildings – the Bell Tower and Drum Tower. At this time the monastery was under the guidance of the master Xu Yun – the honorary President of the Buddhist Association, but Xu Yun’s restoration work was nearing completion, and he stepped aside so that master Hai Deng (who was now also the managing director of the National Buddhist Association) could perform his duties as abbot of Zhen Ru. This was facilitated by the fact that master Xing Fu had temporarily stepped aside as abbot to pursue other duties that took him away from Zhen Ru. Xu Yun established a Buddhist College and asked master Hai Deng to take control of the education programme, and to teach. This he did, particularly in relation to the Surangama and Lotus Sutras – both of which he taught in-depth upon the mountain. Some times, master Hai Deng taught around 120 people, but this often rose to around 300 on occasion. This included both male and female lay and monastic scholars from all over China – including Hong Kong. His voice was clear and his explanations of the Buddhist teachings were precise and engaging. All who heard him teach were immediately taken with his ability to explain in simple terms, even the most intricate of philosophical principles. All who attended his classes never left until the lesson had ended - such was master Hai Deng’s ability as a teacher. Master Hai Deng, as a means of enriching the cultural diversity of the temple, not only taught the Buddha-Dharma, but also taught from the Tang Dynasty poetry tradition, focusing upon the ‘Three Hundred Poems’ (唐诗三百首 – Tang Shi San Bai Shou). This allowed the monks to study and become familiar with classical Chinese literature (as well as Buddhist texts), from which they greatly benefitted. Therefore, master Hai Deng did not emphasis the classical literary tradition only (古文观止 – Gu Wen Guan Zi), but taught in a manner that allowed other traditions to strengthen the Buddhist philosophical position, and not diminish it. As well as classical literature, master Hai Deng would write poems that recorded his own, every day experiences. He some times used this type of poetry to explain the Buddhist Sutras – particularly the Surangama Sutra. Despite this eclectic approach, master Hai Deng very much followed the Ch’an path as his central practice, and wrote important poems to this affect. As a consequence of his poignant comments and insightful observations, many of his poems have been gathered into prominent ‘collections’ and published as distinct works of creative genius. Master Hai Deng could make each section of the three-sectional staff align – making it appear (momentarily), as if a single stick was being held. His flying archery was even more impressive. Master Hai Deng’s two-finger Ch’an was considered the greatest feat, and all who witnessed were stunned. Master Ji Xiang also recalls that master Hai Deng was very concerned about the daily dietary habits of the monks on the mountain, and under his guidance life got very good. He sighed and said; “This was all due to the powerful virtue of master Hai Deng!” There was another interesting matter: “When master Hai Deng preached for two hours (at night), he did not walk around or drink any water. He would only sit (briefly) after the lecture was over. He would then urinate, drink half a cup of boiled water and go to the main hall to propagate the Buddhist yogic practice of ‘flame mouth’ (焰口 – Yan Kou), designed to feed the hungry ghosts. His energy knew no bounds." Due to his strict and diligent Buddhist practice, and his extensive scholarly knowledge, master Xu Yun was very impressed with master Hai Deng. He saw in him the virtuous quality suitable not only to be an ‘abbot’, but also to be a living vehicle for the transmission of the Wei Yang Ch’an Lineage (伪仰宗), making him the 9th generation Patriarch of this school. At the end of the 10th lunar month of 1957, master Hai Deng left Mount Yunju and returned to Shanghai, and the post of abbot reverted to master Xing Fu. He did, however, visit the Zhen Ru Monastery on two more occasions, once in 1959, and again in 1962. In 1959, he received the news that master Xu Yun had passed away, and climbed the Yunju Mountain to pay his respects. 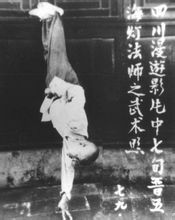 He performed the Buddhist yogic practice of ‘Yan Kou’ (焰口– ‘Flame Mouth’), to assist master Xu Yun in his travel beyond this world and the attaining to the realm of ‘Divine Bliss’ (极乐世界 – Ji Le Shi Jie). Master Xu Yun was unsurpassed as a Buddhist monk, and the saviour of the country. After this, at the request of the resident monks, master Hai Deng gave a demonstration of Chinese martial arts in the main hall. This would be his final demonstration of martial arts on Mount Yunju. In 1962, master Hai Deng visited Zhen Ru to pay his respects, on his way back to Sichuan province. He spoke to his fellow travellers in the Dao (道) and stayed in the temple for several days, before bidding them farewell. Extract Ends. Half-ladles of white water sustain life. At the sea shore, the world is left behind. At the foot of the mountain, the scholar perfects his art. Swallows in flight recall the ‘resting dragon’ (卧龙 – wolong). Immeasurable time preserves the martial prestige. Leaving Shaolin increased the commitment to its path. The benefit of the midnight bell is never forgotten. The Songshan skill of (defence) and attack is well known in China and abroad. Only a few young heroes spread the teachings throughout the nine provinces. I arrived during the good time of the Spring Festival. The vision of endless snow-fall did not cease. With deep affection he praised the Shaolin martial arts tradition preserved and practiced within the Shaolin Temple. Ten years of cold sitting has finally reached the foundation of the matter. Until now humanity has been divided (and uncertain) about the white ox (Dharma). Unable to wash the marrow (洗髓 – Xi Sui) – I dare not sleep. The newly acquired learning is passed on (through the generations). The vast (divine) sky emits a pure, joyful music throughout time. The exiled immortal is blown from place to place. Whilst the white moon is but a reflection of the mind. For ten years, there is silence amongst the autumn cliffs. Do not fear suffering - assistance is given without having to ask. Master Hai Deng had a very strong sense of patriotism for China, particularly in relation to the preserving and passing-on of authentic, traditional Shaolin martial arts. This fact explains why he turned-down an invitation to travel abroad and teach martial arts toward the end of 1982. Instead, at the age of 80 years old, he decided to return to the Shaolin Temple. Its essential spirit endures like the beautiful thousand peaks. Everywhere red pomegranate (liu hong - 榴红) flowers bloom. And the mind remembers many great things. Assist the world; forget accomplishments, and give-up the good life. (Like) the reflection of a half new-moon upon the peaceful lake (平湖 – Ping Hu). This recited poetry (contains) within (it) the pure and tranquil path. (Which) actually refers to the Bao Guang Ch’an Temple of Xindu (County). Refers to the Sheng An Gui Lake (升庵桂湖), also located in Xindu. The master instructs to the lofty peaks of ritual (峨峰礼 – E Feng Li). This conduct is not in vain, but is a constant source of inspiration. Master Hai Deng’s Stupa On Mount Yunju.